VATICAN CITY (AP) -- Pope John Paul II rang in the New Year on Thursday with a renewed call for peace in the Middle East and Africa and the creation of a new world order based on respect for the dignity of man and equality among nations. John Paul presided over a morning Mass inside St. Peter's Basilica to mark the World Day of Peace, which the Roman Catholic Church celebrates every January 1. He appeared in good form, delivering his entire homily in a strong and clear voice despite a relatively tiring holiday schedule. This year, John Paul directed his thoughts to continuing conflicts around the globe. But he stressed that to bring about peace, there needs to be a new respect for international law and the creation of a "new international order" based on the goals of the United Nations. 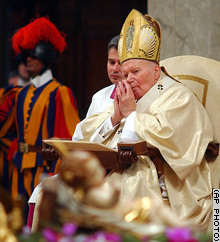 Pope John Paul II presides over a morning Mass in St. Peter's Basilica Thursday, to mark the World Day of Peace. He called for "an order that is able to give adequate solutions to today's problems based on the dignity of the human being, on an integral development of society, on solidarity among nations rich and poor, on the sharing of resources and the extraordinary results of scientific and technical progress." The pope lamented continuing violence between Israel and the Palestinians, and also offered his prayers for his ambassador to Burundi, Archbishop Michael Courtney, who was gunned down by assailants this week as he returned from a funeral. John Paul said Courtney was killed "while he carried out his mission in favor of dialogue and reconciliation" in the central African country, which has been wracked by violence for a decade. "Let us pray for him, hoping that his example and sacrifice will bring about the fruits of peace in Burundi and the world," he said. Earlier this month, John Paul issued a formal document marking the World Day of Peace in which he called for a reform of the United Nations and international law to deal with the evolving threat of terrorism. He said a new respect for international law was the only way to achieve peace and guarantee against the arbitrary use of force. He did not mention the United States by name, but his message appeared aimed at the U.S. anti-terrorism campaign—and in particular at Washington's pre-emptive war in Iraq, which was launched without the specific authorization of the United Nations. John Paul was a vocal critic of the Iraq war, dispatching envoys to Washington and Baghdad to try to prevent hostilities from breaking out and exhorting world leaders that war was not inevitable and was "always a defeat for humanity." "Because peace is possible ... it is necessary," he said during his homily Thursday. The New Year's Mass was the last major celebration of the Christmas season for John Paul, who is 83 and suffers from Parkinson's disease, which makes it difficult for him to speak, as well as knee and hip ailments that make it almost impossible for him to walk or stand. He cut back some of his holiday activities and scrapped two traditional papal events—the ordination of bishops January 6 and baptisms on January 11. But throughout the Christmas season, he has appeared far stronger than during the series of celebrations in October marking his 25th anniversary as pope. Then, he was unable to deliver many of his homilies and had to have others to read them on his behalf.